Today I started a wild goose chase. My family has a treasure. 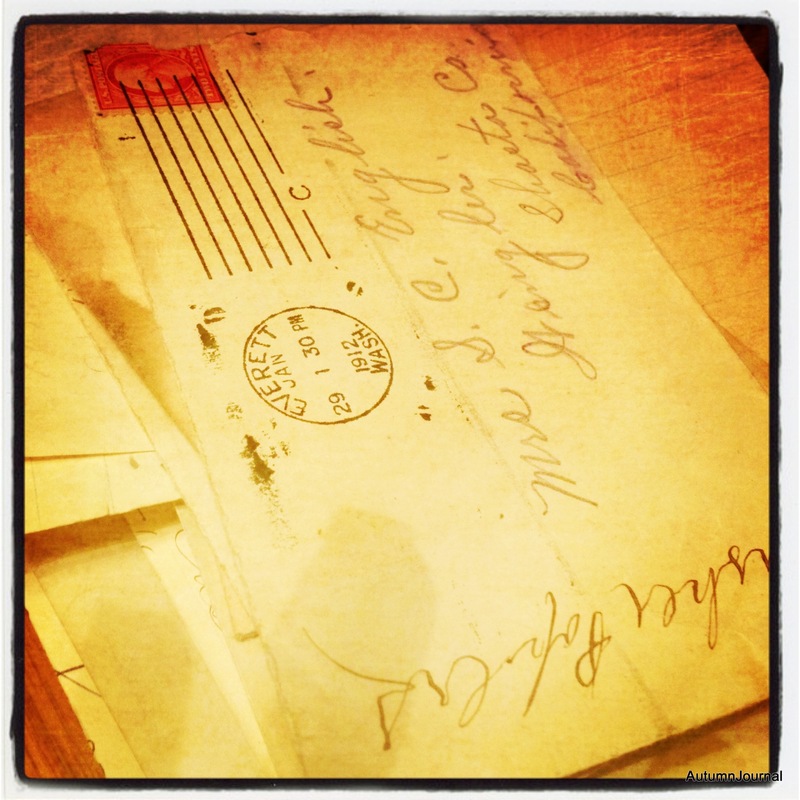 A cache of family letters from 1892 to 1927 was uncovered several years ago. The letters are funny and sad and at times horrifyingly poorly written. Sometimes they are truly charming. I find them endlessly fascinating. I started building out the family tree beyond my direct ancestors to try to understand just who these people were who wrote the letters. Challenges and news in the letters piqued my interest and I started researching the areas in which they lived, what was happening in the country and the world at the time the letters were written. What was happening where they were, in their world? A lot happened in those three and a half decades. Spanish flu, the first world war, droughts, diphtheria epidemics, land grants and migrations west. My second great grand uncle was adamant that the family vote for Weaver in the election of 1892. Neither my uncle’s campaign nor Weaver’s was successful. Because I am so endlessly fascinated with the letters I began trying to track down far flung, distant relatives, descendents of the authors of the letters. First cousins four times removed and fifth cousins and people who aren’t blood relations at all on the off chance that they would find the letters fascinating too. And I have found some. 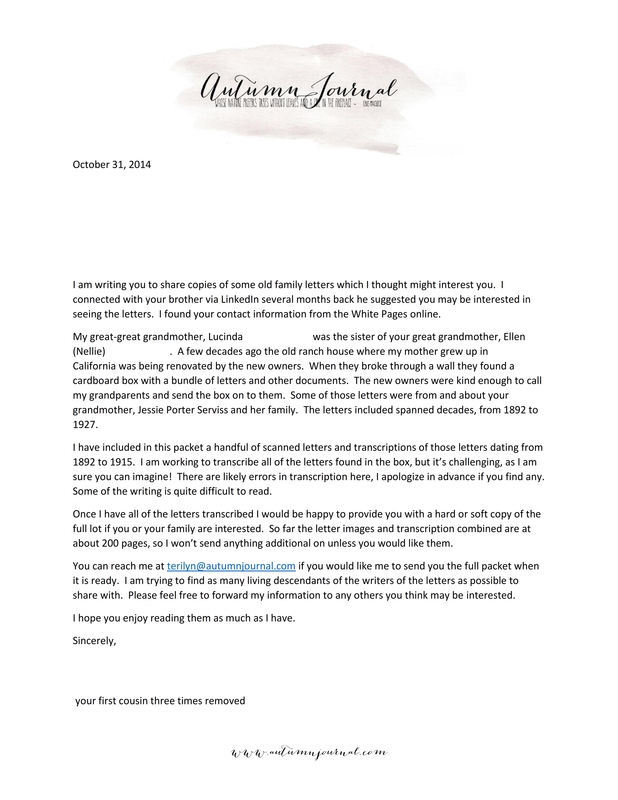 So today I wrote them letters, and printed out copies of the old family letters the are written by, or reference their distant direct ancestors. I have no idea if I will ever hear back from them. No idea if they will even read the packets I put together. But it felt good. And maybe, just maybe, it will make someone’s day to get a soft, brown envelope in the mail with words written by their grandmother, or great-great uncle or cousin talking about their day, their life a hundred years ago. Maybe my own personal community, my village, will expand just a bit to include people I never would have known, but who have ancestors in common, if someone had not decided to renovate a house years ago, and taken the time to call my grandparents and return these letters to our family. 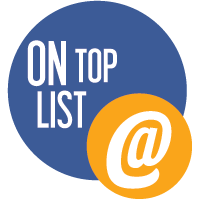 This entry was posted in Family, Life and tagged family, family tree, Genealogy, history, letters, strangers on 31 October 2014 by Autumn Journal.